Felling trees is just one aspect of tree services we offer, but it’s one of the main ones. It’s how we started, and how we’ve maintained our reputation for being great tree surgeons. 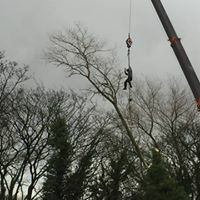 We take tree felling very seriously and we meticulously plan each and every tree felling job. With a good tree felling plan comes safety now, and time saving in the future. One of the greatest risks of felling trees are obstacles surrounding the area. These might include buildings, overhead wires, underground cables, public access ways, the beloved dog. All these things, and more are taken into consideration when we are tree felling. Upon inspection of the trees that need felling we will decide on a number of things which will make the operation go smoothly. We’ll look at factors such as the strength of the wind, the terrain, any obstacles, together with the condition of the tree itself. The natural tree lean, the length, species, age, and decay of the tree, all have their role to play in the direction a tree needs to be felled. If you’re located in the Stockport, Manchester, or North West area and would like more information on our tree felling services please call 0161 483 7816. Also, if you would like a quote from me, Ben, you’re local friendly tree surgeon; then please call or use the contact form here. Bostock Total Tree Services can offer help and assistance with this process; call today to find out more!